When I flew to Japan in 1990 to begin my three years of teaching with the JET Programme, one of my seat mates on my flight out of Atlanta was a young man named Rich from Florida. It turned out that Rich and I were being posted to the same city, and we quickly became fast friends. Prior to teaching in Japan, Rich had spent a year teaching in China and he traveled back to China on a few of his breaks. 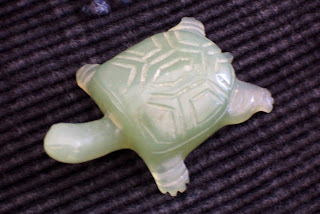 When he learned of my turtle collection, he promised he would bring me back a jade turtle from one of his visits. 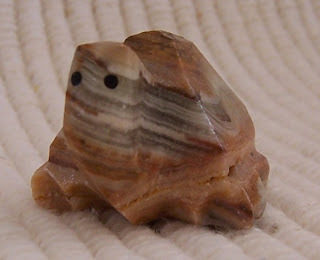 This little guy was the result - he's kind of pale in his head and feet, and has a deeper green in his shell, but is overall not very "jade" looking - I think he was the only quality of jade that was in Rich's budget. I credit Rich with keeping my sanity during my low points of homesickness, lovesickness and cultural frustration during our time in Japan - and I think/hope I did the same for him. He now lives in Nevada - and I have not seen him in about 10 years - but this little turtle is a reminder of a good friend. I think he disowned me when I sent a Clemson baby outfit for his first child??!! Go Tigers!! ...and you get more topsoil with patience and understanding. Rather than getting too angry at our missed topsoil delivery, Hubby and I decided to call the guy and see if he could still get it to us before we went off on a tare and got it somewhere else. Turns out there was a real family crisis he was attending to - and he was more than apologetic. Not only did he bring us the topsoil last night, but he charged me less AND brought me a whole extra yard of soil. I paid him the full amount anyway. Seeing my Munchkin's face as he watched the dump truck tip up it's back in the driveway and dump the topsoil was WELL worth it! We watched from an upstairs window so we were above the truck - other than the exhaust fumes trailing in our upstairs hallway, it was the best place to be!!! It is now tarped and bricked and waiting for Hubby's return so we can break out the shovels and the tractor and the trailer. Oh - and the 6 yards of mulch comes on Monday. At this rate we will be parking down the street - we are running out of driveway!!! The Munchkin was cooperative -and before dinner I managed to get most of the fabric washed and dried, and commenced cutting, breaking only for dinner and bedtime stories, and finishing up around 10:45PM. 17 lunch tote covers got cut out - with pockets - and 7 linings. 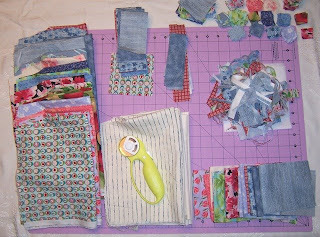 The rest of the scraps were cut for various pouches, and whatever was left went into 2 1/2" strips and 1" squares - all stash management ideas I picked up from Bonnie at Quiltville. The little pile with the rotary cutter on top is ALL that was left - except for the small pile of big remnants not shown in this photo. That's all the garbage I had - and if I had more energy I probably could have squeezed another couple 1 inchers out of a few pieces - but I was done. 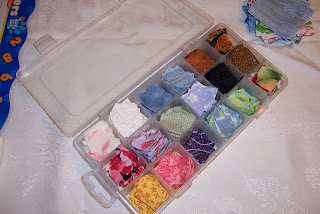 I am building up my "palette" for the watercolor quilts - and purchased a little case to keep them in - after tonight's efforts I think I either need to get a bigger case, or get a couple more for the different colors. I am already visualizing how these little bits will work into some great watercolor panels. I am not sure if I am going to be designing the panel, and fitting the fabrics into it, or if knowing what I already have cut out will influence my designs. Time will tell on that one. I have a few more fabrics still to be washed, and a couple more in my stash that may get used. I think I will see how the bags are received in August to decide how much more overhead I want to wrap up in this between now and December. Otherwise EVERYONE will be getting lunch totes for Christmas!!! 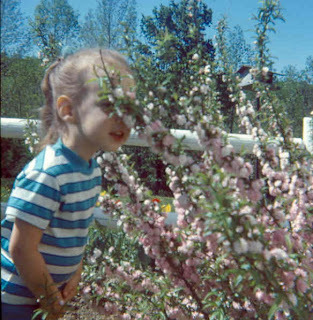 How Does Mommy's Garden Grow??? When the weather is warming up around here - the pull of the yard and garden is tough to resist - so I save my indoor crafting for after dark or rainy days and get out in my garden as much as I can. When we first purchased our house (which was built in 1929) the previous owner had been ill for some time and the yard and gardens had been neglected and overgrown. We looked at the house in April - in the snow - and moved in July - in the HOT HOT weather - neither of which were conducive to any kind of gardening. I did not do much with the garden the first year - and waited until the following spring to see what would appear. 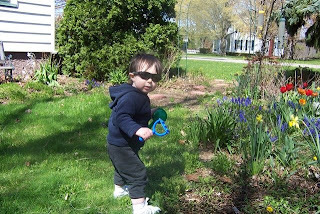 I was delighted by banks and banks of my favorite Grape Hyacinth's all along the driveway, snowdrops along the back fence and a few daffodills here and there - but then suddenly the side yard grass ERUPTED into a huge bed of tulips, hyacinth and daffodills! What I thought was just poorly growing grass was actually a hidden treasure trove of spring goodies! We have slowly turned that grassy area into a huge flower bed, adding mulch and year-round plantings, evicting the grass that still wants to grow there after all these years, and turning the side yard into a little oasis. The bench (you can see just a corner of it in the left side of these 2 pictures) came from another estate sale - and even in the 2 years since the top picture was taken the garden has grown to embrace the bench, with a hydrangea on one side and a GORGEOUS bleeding heart on the other - and a tiny path through the forget-me-nots to reach the bench. 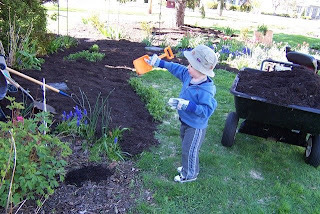 The Munchkin and I like to sit there and fill the watering cans as he helps me tend to the new plantings and annuals. Grass has given over to candy tuft, daisies, black eyed susans, glorious columbine and a few other goodies - surrounding a lilac tree that grew from a huge one that was on the property. I am nostalgic with my plants - thinning seedlings is tough for me as I hate to see any of them go to waste - I love to get plants and seeds from friends and family and tend to label some of the big ones so I will always remember where they came from. Indoors I have a Christmas Cactus that is a cutting from one that has been in my mother's family for probably 50+ years, and when we bought the house the family left us Monnie's cactus to start our own history with. Some of the plants were cuttings from our house in Alfred, NY that went south with my parents in '88, and came back north to me to find a new place to put down roots. True confession time - a little pet peeve of mine is the proliferation of Chinese and Japanese characters in the US - being used incorrectly. I guess 10 years of studying and using the language have made me a bit critical - but it really can be comical at times. Character meaning is a whole topic in itself, but one of the simplest things is keeping the writing RIGHT SIDE UP! I have seen fabrics, tatoos, clip art and more that simply have things upside down - or worse yet - mirror image. In some cases all mixed up. Yes - I know they can be looked at as "artistic" - but if we did the same with English, we would get laughed at! So to avoid the laughter, I found a quick "guide to writing" that can help you look at your fabric or whatever and perhaps determine if it is upside down. If it does not look like the strokes could be created using the rules below - you are probably looking at it upside down. Flip it over - check again. If it looks more reasonable - then you might have it right. If you are still not sure - take a picture and email it to me - I will be glad to help out! 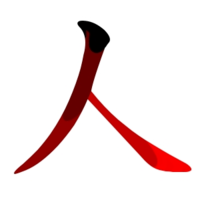 The Chinese character meaning "person" ( , Chinese: rén, Korean: in, Japanese: hito, nin; jin). The character has two strokes, the first shown here in dark, and the second in red. The black area represents the starting position of the writing instrument. This rule applies also to more complex characters. For example, 校 can be divided into two. The entire left side (木) is written before the right side (交). There are some exceptions to this rule, mainly occurring when the right side of a character has a lower enclosure (see below), for example 誕 and 健. In this case, the left side is written first, followed by the right side, and finally the lower enclosure. When there are upper and lower components, the upper components are written first, then the lower components, as in 品 and 襲. When strokes cross, horizontal strokes are usually written before vertical strokes: the character for "ten," 十, has two strokes. The horizontal stroke 一 is written first, followed by the vertical stroke → 十.
Vertical strokes that "cut" through a character are written after the horizontal strokes they cut through, as in 書 and 筆.
Horizontal strokes that cut through a character are written last, as in 母 and 海.
Right-to-left diagonals (ノ) are written before left-to-right diagonals (乀): 文. 5. Centre verticals before outside "wings"
Vertical centre strokes are written before vertical or diagonal outside strokes; left outside strokes are written before right outside strokes: 小 and 水. Outside enclosing strokes are written before inside strokes; bottom strokes are written last: 日 and 口. This applies also to characters that have no bottom stroke, such as 同 and 月. 7. Left vertical before enclosing Left vertical strokes are written before enclosing strokes. In the following two examples, the leftmost vertical stroke (|) is written first, followed by the uppermost and rightmost lines (┐) (which are written as one stroke): 日 and 口. Bottom enclosing strokes are always written last: 道, 週, 画. Minor strokes are usually written last, as the small "dot" in the following: 玉.
I really wish my cell phone and my computer would get along - believe it or not I went out to play without the big camera this weekend and had some great photo opportunities that ended up being snapped with the camera phone - and now they are stuck there until I can slip the card into Hubby's computer and then move them over to mine. Our weekend was kind of like the threads on my practice free motion quilt piece -meandering all over the place. 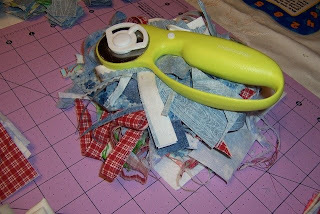 Believe it or not I did not get to sew until Monday evening - both Saturday and Sunday we went out to dinner after a very very full day of working and playing in the yard, and just dropped after getting home and getting the Munchkin into bed. His "playground" is now wasp free (we hope) and refurbished with a new slide, canopy, ladder handles, pirate steering wheel and periscope - and the turtle sandbox has migrated from the top of the yard to under the "playground". We have one VERY happy little guy! He "helped" Daddy screw down the boards that were just nailed together, and held parts as we installed all the new "gadgets". He's working on getting up the ladder by himself, and still a bit unsure about that big slide, but we will get there, eventually. In addition to all the "playground" renovations, Hubby cleaned out the garage, mowed the lawn, and prepped for the 6 yard load of topsoil that was supposed to arrive at 10Am Saturday, no wait-1:00 PM, no - between 3:30 and 4:00 PM, no wait again - as of when they called at 8:45 on Saturday PM we were to be the first delivery around 10:00 AM Sunday... no - WHEN?? It NEVER happened, they never called back, and so we remain un-soiled. At least we had not rented any heavy equipment to help with moving it all to where it needs to go... and we had not yet paid for it. I think we will be taking our business elsewhere. Just too bad that it was pretty much too late to schedule with a different provider for THIS weekend. Despite that setback, we had a nice relaxing working weekend, planting pots of plants (herbs and flowers), building planter boxes (to be filled with the aforementioned top soil), attempting to move a very very big log that we now realize is immovable, picnic lunching out in the yard, and just making some good memories. 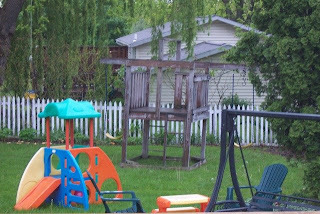 Monday was a bit more frustrating - windy threatening weather kept us inside - but we made great progress purging some files and papers and finding the office again while the Munchkin played with his trains and I tackled laundry that had been neglected while we were outside - great progress right up until we realized that our dryer was no longer drying - and we had 2 loads of wet laundry to take care of, not to mention the piles of dirty stuff in the wings. A run to Home Depot for a drying rack was fruitless (and rude service on top of an already frustrated mood resulted in me walking out without the cart full of other items I had planned to pick up) so I ended up at Wal Mart, found a rack I could make do with - and headed home to find that Hubby had dissected the dryer, found the defective heating coil (A real nasty one, too!) and found where he could buy a replacement. Keep your fingers crossed that it all goes back together and works, otherwise we will be doing some appliance shopping under duress - not the way I want to buy a new dryer. So after company for home made pizza and rhubarb pie (I did not bake - it was hubby's pizza, our rhubarb and MIL's wonderful pie! ), and a tubby for the Munchkin - Zoe and I finally got to spend some quality time together - meandering and stitching. After practicing on some blank fabric, I meandered around the lily pond fabric in the picture above, eventually cutting out a piece to make a quilted chap stick holder (no picture of that, sorry). Fun at every turn - just have to remember to switch to my glasses, as watching the fabric as I stitch made my contacts go a bit crazy. After the Munchkin turned in for the night, Zoe and I spent some time getting acquainted over a small project I already had cut out and ready to go. Last night I tested out her stitches, checked her tension, and made sure she was ready to run, so tonight I was able to jump right in to a project. There is a bit of an awkward "get acquainted" stage - she has an automatic "needle up" position when sewing stops which will take a bit of adjustment when I want to pivot, and the presser foot lever and thread cutter are both in different locations, so I need to reprogram my "autopilot" on these things. My only gripe today is not with Zoe - but with JoAnn's, which has suddenly revamped it's whole "competitors coupons" policy and only accepts them for craft items. Heck - in my book their ENTIRE store is craft items, but nope - the plastic storage box I picked out, as well as the thread - both counted as notions and failed to be covered by the "extra" coupons I had. I can understand the cut fabric - since the other stores don't sell that - but geez... I am spending my money in THEIR store - and now they WANT me to go to the other stores for these items??? OK... this is the sound of those items being dropped back on the counter and my money walking out your door. So sorry - too bad. 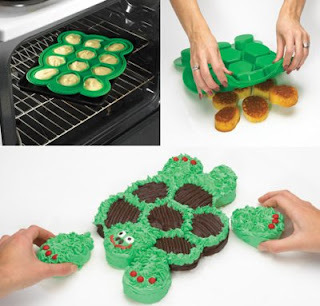 I think I need one of these cupcake molds to celebrate. Zoe is my brand spanking sparkly new Janome Sew Precise - she purrs like a kitten, free motions like a dream! We finally got her home around 8:45 last night - after test driving one, sending her older sister Melody in for service, and shopping the fabric side of the store, and picking up some accessories, we finally headed to dinner a little after 7:00pm. We had a nice lingering dinner at Chili's with the Munchkin - it was his first Chili's experience and he loved the "triangles" (tortilla chips") in the basket, and devoured his grilled cheese. Hubby and I put a hurting on a platter of fajitas. Yum!! 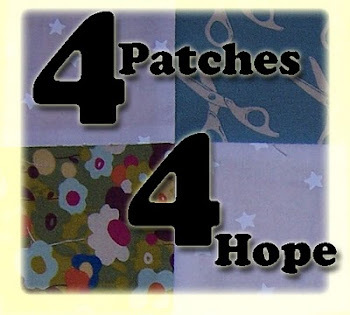 Her bobbin wound easily, the automatic needle threader is a wonder for tired eyes, and I grabbed some fabric to play. Her tension was spot on right out of the box, and I quickly tested out all the stitches I could with the standard foot. Then - instead of changing to another "standard" foot and trying new stitches, I jumped right to my darning foot and tried free motion quilting for the first time ever. Oooohhhhhh - smooth!!! I am in love!!!!! When I told Hubby I "needed" a new machine because my old one was going wonky and I "needed" to be able to do free motion, he jokingly asked what the traditional 14th anniversary gift was. So we looked it up - geeks that we are - and discovered it was ivory. I asked him if an ivory colored sewing machine case counted. He said yes. And - since her older sister needed a name now so she would not feel slighted, the Singer has now been dubbed "Melody"
Yeah - geek - that's me! As most of you should know by now, I am a member of the Churchville Lions Club, Churchville, NY. Not only am I a member, I am a past president (actually took maternity leave for the Munchkin during my term as president!!!) - but lately I have been spotty in attendance. Hubby is also a member, so we try to tag team on Tuesday nights and send on or the other to a meeting, but they have been few and far between. Two weeks ago I decided at 6:15PM that I was going to head up to the meeting after dinner, as I had not been to one in a while. During the meeting, our President-Elect asked me to stay after for another little committee meeting, as he was turning control of a committee I am on over to a new chair. That new chair is also a "sometimes-Lion" - comes to maybe 2 meetings a year. He lives in the subdivision behind my house. After our little meeting, I casually asked Joe, the "sometimes Lion" if his family was participating in the community wide yard sale that coming weekend - mainly because I know he has 3 boys and would probably have stuff for sale that would be good for the Munchkin. His response - "Why - do you want the ...thingy?" 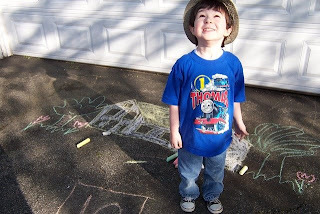 - and he gestured like he was outlining a roof and walls. Knowing he had a "playground" I nearly held my breath while he groped for the right word - hoping that he indeed meant the playground and not their basketball hoop, which we already have. And you already know the rest of the story. 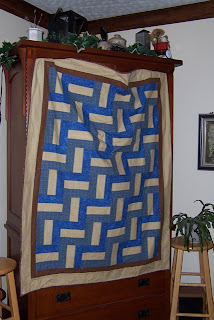 This quilt has now been delivered - and loved- so I can post a full picture of it now. See - my "entertainment center" is good for something - like holding a quilt for a photo when A) there were too many little trains on the floor to lay it flat and B) Hubby was at work and the Munchkin was upstairs napping. I did forget to snap a picture of the matching pillowcase, but it is the cream color with the brown binding strip and the swirly blue (less bright of the two blues) for the cuff. And I STILL have enough brown binding for 2 more lap quilts!!! The Munchkin calls it his new "playground". This weekend we are leveling it up, adding some handles, a slide and a new canopy, and probably putting some sealer on it. The turtle sandbox will move underneath with some mulch, and we will be good to go. I can't wait to see him climbing on it! The Munchkin had no idea what Daddy was doing - until they got it home and he happened to look out the back window. He was ear to ear smiles the whole rest of the evening, and Daddy got a HUUUUGE hug when he came in the back door! Tonight is Mommy's turn for a surprise - we are going HERE after dinner. NOTE: For those who read too fast - that says going here AFTER dinner, not FOR dinner. I am very bad about putting tags on my quilts - so while working on this graduation quilt I resolved to be better about that - and to go back and make tags for some quilts that have already been given away - at least those I have access to. I like naming my quilts - it's fun, and usually comes out of the sewing process, or the fabric and pattern, or some little inside tidbit between me and the recipient. "Trouble with Turtles", "Orange Brick Road", "Random Road in Springtime", "Summer Sunshine", "Sock Monkey Hop" - these are just a few quilt tags that were made up today. Joe is studying Russian - in fact he just popped in my office prior to taking his Russian final exam. So I went to translate.google.com and plugged "Congratulations" into the translator, and the above text is what it spit back out at me. I have no way to verify it - so will take Google at their "words". The winner was Florence H., an 80-year old member of the Carolina Pine Quilters Quilt Guild, the same guild that most of the Busy Bees are in. She is a "help when she can" Busy Bee, and actually only got a chance to get into town to buy her tickets at the Aiken Quilt Shoppe (where Lazy Sister Sue also teaches!) on Thursday. With the support of everyone on the raffle, a goat raffle, a Bunko night, and various other sales, fundraisers and donations, the group raised over $4000, which will go to the American Cancer Society. Thanks Everyone! - Look for more from the Busy Bees... but we will give them a chance to recover first! Just realized I had not posted any of my turtle collection pictures recently - I got so caught up in the new turtles, as well as the "quick, gotta get this done NOW" quilt project (which I am happy to report is done except for the label - and with a week to spare). This little guy is a carved stone turtle from Akiyoshidai - the largest karst region in Japan, and location of Akiyoshiodo cave. I picked this little fella up as we exited the cave - the sidewalk leading out was lined with little gift shops with all sorts of stuff. This was part of the school bus tour that I mentioned when I introduced Topsy. We went to the cave area first, so this was the first turtle picked up along that trip. 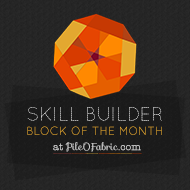 Through the month of April, the wonderful folks at Sew Mama Sew were holding a tutorial contest, and crafty folk from all over the world entered their wonderful tutorials and ideas - posting them for all of us to share and enjoy. I had hoped to enter my watercolor seahorse tutorial, but alas that is still a work in progress and missed the deadline. One of the winners in this little contest was the Square(ish) Bottom Hobo Lunchbag. I had been wanting to make some fabric lunch bags for each member of the family for a while now, but was undecided on the design. This little tote was a great combination of the furoshiki style that I have been utilizing, and a more structured bag. 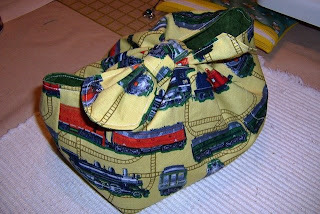 This train version is for The Munchkin - not only does it hold his lunch AND breakfast for the day - it matches his Miranda day tote (as well as the pillowcase, two totes and a Wonder Wallet given away that I managed to get all out of this 2 yards of fabric). I was a little bit shy on the fabric needed for one strap, so the fabric is pieced half way up, but it does not seem to make a difference. 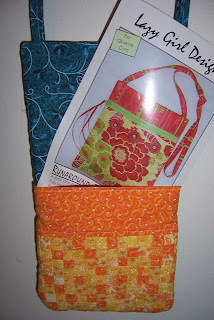 You could get really "patchwork" creative with this - as the bag is fully lined it really makes no difference if either the covers or linings have some extra seams. The other thing I did was to change the technique for boxing the bottom. The original instructions call for doing the corner "triangle" thing, which always seems to go wonky on me. Instead I cut a 3x3 square notch out of each bottom corner (and threw those in my quilt block scrap bag!) - and then just sewed that closed after I stitched the sides and bottom. I made a 2nd one - but did not get pictures of it last night. On that one I took some scraps and added a square pocket inside - good for milk money, little notes, or condiment packages - and also made the bottom portion of the bag 1" taller overall to accommodate the tall round containers I transport my soups in. 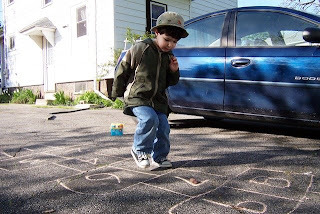 Hopscotch - he "jumped" to 10, then it expanded to 21 and he was "jumping" backwards. Hope to post a video of this soon - it was too funny! 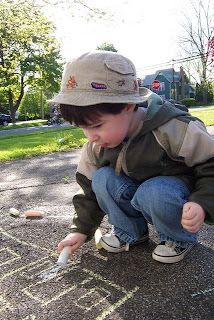 before he picked which chalk to color this house drawing with. "look up" - I said, meaning for him to look at the camera. Instead he looked "waaay" up - I wonder what he was looking at???? 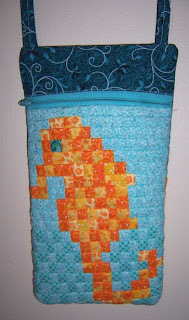 I finally finished the Seahorse Runaround bag late Friday evening -and carried it to the shower on Saturday. The mommy to be LOVES the design - and can't wait to see the quilt - and the bag managed to stay on my shoulder the entire time. I still need to add the zipper embellishment - but have not found a chance to sneak up to the attic and muck around in my beads and charms recently. The zipper was a "freecycle" find that was the PERFECT color!!! I could not have matched that better if I had tried! This is a fun way to really embellish this pattern, but there are a couple of things to note if you want to try this yourself. 1. 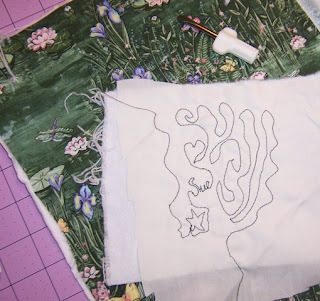 The watercolor technique really shrinks up the design, so be sure you take that into consideration when you cut your interfacing to start with. Measure a few times -then cut. You also need to take into consideration the bulk created by all those seam allowances and interfacing - it also takes away from the overall dimensions. This bag is about 2 inches narrower than a regular Runaround bag due to a measurement oops on my part- and it makes it much harder to get your hand to the bottom. It is also longer - which was intentional -but compounds the "bottom of the bag" issue. 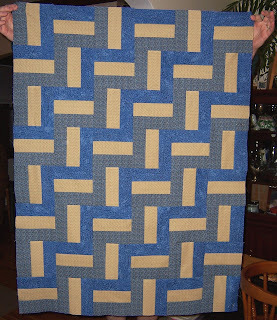 If I had to do it again, I would start out planning at least an extra inch in finished width over the original pattern. 2. 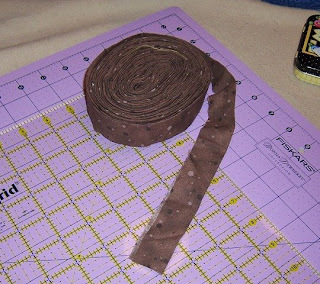 Even with sewing on the grid lines, the whole project has a tendency to twist, so take it slow and easy and try to pin at least a bit to help keep things square. 3. 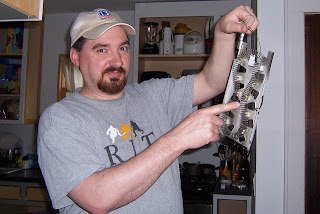 Because of the twisting, DON'T run your main design too close to the edge rows - you will probably lose some of it... I did. The poor seahorse lost his tail a bit! 4. Also because of the bulk, DON'T plan on putting watercolor panel to watercolor panel and stitching. Your machine won't like you, and you won't like having to turn it. It's doable - but not something I would do again. ...that's all I can recall at this time. Have a few more of these planned - so look for more to come. I had high hopes to post pictures of my completed Seahorse bag - as well as some comments for anyone wanting to make one themselves - but blogger and Google had other ideas, and instead I spent the entire morning debugging and repeatedly rebooting my computer. So NOW I get back in to blogger - but it is nearly time for me to head to the baby shower so I am not going to try to download and process photos now. I will add them later. The baby quilt? not done - but I have a cute little poem/card with some teaser photos that I managed to put together before the computer went wiggy - as well as the big teaser bag... I do have Eric Carle's Mister Seahorse book and some other little goodies so she won't be entirely "empty handed" - although I am sure we will have to rent a u-haul to get her home tonight!!! Sometimes you need a "Time Out"
Yesterday I took a digital "time out" - I went the entire day without touching the computer, and without watching TV - only using my cell phone to touch base with Hubby as I ran some errands. Felt pretty good. So on Monday evening, I got it in my head to make a quilt for Joe, the student who has worked in my office with me since he started as a freshman, 4 years ago. He graduates in 2 weeks! 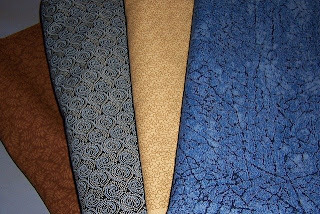 So Wednesday night I bought some fabrics - being sure to get something that will go with my yards and yards and yards of binding (thanks to LSS for the blue/brown combo hint - I am really enjoying it!) - and between the time the fabric got tossed in the laundry at 7:00 PM on Wednesday, to 11:00 PM last night - THIS is what I've accomplished. Tonight I will finish the seahorse bag and wrap the other gifts for the new mommy - and if I get time will probably put the borders on Joe's quilt. The seahorse quilt will have to wait for another day - but the baby isn't here yet, so I have a bit of a buffer. The "time out" was good -recharged the batteries and it felt good to see results so quickly!! So in the meantime, I decided to play with the scraps of interfacing, leftover orange pieces, and some of the extra blues. I am making a modified Lazy Girl Runaround Bag out of this piece, and will use all the other leftover orange bits to do the top front. This "seahorse" was done totally freehand, without looking back at my pattern. I think he turned out pretty good. This block is approximately 8 inches wide and 10 inches long. It needs a bit of trimming and good pressing to square it back up a bit. It was a good warm up for assembling the quilt panel and also gave me a good idea of how much bulk I will be dealing with behind the big seahorse so I can be figuring out how to finish it. Boy those squares get REALLY tiny!!! Each little square you see here is 1/2 inch across!!! Oh - and this bag is all for ME ME ME!!! This way I have something to keep after I give the quilt away. Last month Prolific Online Quilters Jen and Jill were gallivanting around Ohio prior to a quilt retreat and tantalized me with pictures of resin turtles they found at a JoAnn's store. Multiple visits to my local store proved fruitless, as no turtles were to be found. Last weekend Hubby and I were in Niagara Falls, NY for a convention, and were able to do some shopping on the way home before picking up the Munchkin from Grandma. We checked out the JoAnn's in Buffalo, and lo and behold, THEY had the turtles that Jen and Jill had seen. Hubby, however, has been wanting a garden gnome for the longest time - and every time we see a Travelocity commercial it gets worse. 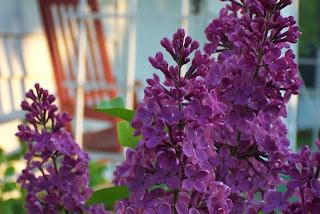 Soon after this photo was taken the two of them meandered out into the garden, where they are now resting comfortably under an arborvitae, keeping an eye on a newly transplanted lilac (that the deer have already nibbled) and watching the lily of the valley spring up around them. I wonder what he's reading? Just a quick reminder that the Busy Bees Quilt Raffle cutoff is noon on Friday, May 16th. Thanks to all of you who have already supported the team through your purchases. We really appreciate it!